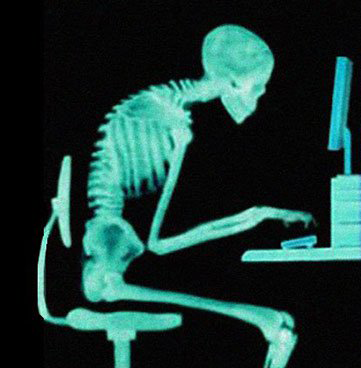 Sitting disease and what happens when we sit for long periods! “We all sit too long, but exactly how long might surprise you. Sitting when driving, working, watching TV, reading, and eating all adds up, so that on average a person spends an astonishing 8 hours every day sitting. Sitting too long matters because when you sit too long various things start to happen in your body: Your heart rate slows and muscles burn less fat, which makes those fatty acids more likely to stick to your arteries. Your body becomes less responsive to insulin, causing your body to accelerate insulin production. Your abdominal contents are compressed, slowing down digestion. Your hips become stiffer as they are extended less. Your venous circulation in your legs is reduced, and blood pools in your feet. Conversely, within 90 seconds of standing up, the muscular and cellular systems that process blood sugar, triglycerides, and cholesterol (which are mediated by insulin) are activated. The long term effects of “Sitting Disease” are startling. In 2012 researchers from Loughborough University and the University of Leicester assessed nearly 800,000 people from a range of countries. They found incredibly strong evidence linking excessive sitting to poor health. People who sit over 6 hours are 112% more likely to develop diabetes, 147% more likely to suffering a stroke or heart attack, and are 49% more likely to die from any cause. This means that, for people who sit most of the day, their risk of heart attack is about the same as smoking. They are also more likely to suffer other health problems such as venous leg ulcers, deep vein thrombosis, and osteoporosis. You can read more of Rebecca’s article here as well as her 10 point plan for sitting less.